The Gold Rush of 1849, publicized world-wide, first attracted Jews to California. They traveled from England, France, Poland, Posen, Russia, the German states and many parts of the United States, to join with people from all corners of the globe seeking success in the former Mexican Territory. Some were American Sephardim, several generations in this country, while many others were immigrants who settled elsewhere in the United States before the great gold strike. Jewish and civic communities developed overnight, with Jews as California's founders serving in leadership positions in the new multi-ethnic state. Without a Protestant hegemony and with little antisemitism, Jews and Jewish institutions flourished. Many Jews, having first lived in the eastern United States, were familiar with English and American customs. Selling dry goods and clothing to miners and other new arrivals, most Jewish men became merchants, wholesalers, or clerks in San Francisco, Sacramento, or the numerous river and mining towns. Jewish women, usually the wives or sisters of merchants, also owned shops and worked as milliners and teachers. Frequently, merchants operated branches of their city stores in the foothill gold-mining camps or in the river supply towns under the management of relatives or friends whom they brought from Europe. Jews in Nevada City, Grass Valley, Mokelumne Hill, Jackson, Placerville, Marysville, and Sonora gathered to observe holidays and established cemeteries. Placerville and Jackson also built synagogues. By 1861 there were Jewish communities all over the state. Men and women established benevolent, religious, fraternal, and social associations. Maẓẓot were brought in from the larger cities in the spring, and in the fall stores closed for the High Holidays. Ephemeral Jewish communities are said to have existed in Coloma, Fiddletown, and Jesu Maria. Folsom, Los Angeles, Merced, Oakland, Oroville, Petaluma, San Bernardino, San Diego, San Jose , San Luis Obispo, Sacramento, Santa Cruz, Shasta, Stockton, Visalia, and Woodland have long-lived Jewish communities. 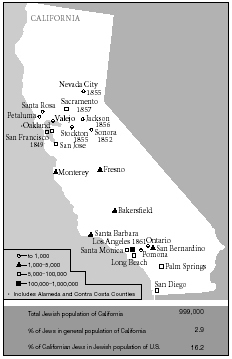 Jewish communities in California and dates of establishment. Population figures for 2002. By end of the 1870s, owing to the end of the gold rush, many Jews moved to the larger cities of the state, especially San Francisco. The estimated Jewish population of California then was 18,580, with the majority living in San Francisco. Indeed, Jews represented 7 to 8 percent of the city's population. From the 1850s to the present day San Francisco has supported a continuous Jewish presence. Organized Jewish religious life in California dates to the High Holidays of 1849, when services were conducted in San Francisco and Sacramento. The following year when men and women gathered in San Francisco plans were made to establish a congregation. However, when they could not agree on the selection of a proper shoḥet (ritual slaughterer), San Francisco's Jews founded two congregations in 1851. Sherith Israel's members were English, Polish, Posners, and Sephardim, while the French, Germans, and American-born Sephardim organized Congregation Emanu-El. Together with their benevolent associations the two congregations purchased adjoining land for cemeteries. The first lodge of B'nai B'rith in California and the West, Ophir Lodge No. 21, San Francisco, was chartered on August 13, 1855. Its members in 1870 founded the first region-wide organization, the Pacific Hebrew Orphan Asylum, to ensure that Jewish boys and girls were raised by their co-religionists and not by church orphanages. Early San Francisco also supported several religious schools for children, and a day school started by Rabbi Julius Eckman , the state's first rabbi, who arrived in 1854. Eckman, beginning in 1857, also published The Weekly Gleaner. Jewish newspapers kept readers throughout the Pacific states informed about community life. In the 1870s Californians could subscribe to four Jewish newspapers. In the 19th century, when San Francisco was the commercial capital of the U.S. Far West, merchants, Jewish and gentile, and the communities they served, from Alaska to New Mexico and Hawaii to Montana, depended upon the Jewish manufacturers and distributors of San Francisco. Many northern California Jewish families achieved prominence in various mercantile and agricultural enterprises. Most noted were Levi Strauss for denim pants, M.J. Brandenstein for coffee, David Lubin for agriculture, Adolph Sutro for mining engineering and the Zellerbach family for paper. Families including the Fleishhacker, Steinhart, Stern, Hellman, Dinkelspiel, Gerstle, Lilienthal, Sloss and Sutro became noted for their philanthropy. San Francisco's Jewish women, many the daughters and grand-daughters of the city's founders, were active in social, cultural, and philanthropic organizations. The Emanu-El Sisterhood for Personal Service, started in 1894, assisted East European immigrants and later established a settlement house for Jewish working girls. Hadassah formed a chapter in the state in 1917 to support its medical causes in Palestine, later Israel. California was also home to anti-Zionists who were active members in the American Council for Judaism , an organization committed to combating Jewish nationalism. Its large membership in California, especially San Francisco, may be attributed to an adherence to classical Reform and the view that California for them was the "Promised Land." After the establishment of the State of Israel, the community fully supported it. In Los Angeles a Hebrew Benevolent Society was organized in 1854, followed by Congregation B'nai B'rith in 1862, now Wilshire Boulevard Temple. In the 20th century there was a great influx of Jews to Los Angeles, and the Jewish population of the southern part of the state soon overtook that in the northern part. Jews were attracted to Los Angeles because of its favorable climate and employment possibilities. The warm climate was a factor in the establishment by Jews of hospitals and health centers, the most notable of which is the City of Hope Medical Center in Duarte. The advent of motion pictures also brought many Jews to southern California who soon emerged as the leaders of the industry: the Warner brothers, Louis B. Mayer , Samuel Goldwyn , Irving Thalberg , William Fox , Jesse Lasky , David O. Selznick , and others. There has also been a great deal of participation by Jews in radio, television, and recording. From statehood Jews participated in California's public life, Solomon Heydenfeldt on the State Supreme Court (1851–57); Adolph Sutro, mayor of San Francisco (1895–97); Julius Kahn in Congress (1899–1903, 1905–24) and his wife, Florence Prag Kahn (1924–1937), elected after Julius's death, became the nation's first Jewish congresswoman. Many other California Jews have been elected to national, statewide, and local offices. In the early 21st century the state was represented by two Jewish senators Barbara Boxer and Dianne Feinstein and several Jewish House members. The Jewish population of the state increased dramatically after World War II because of increased employment. Jews, like other families, began to move to suburbs and new community organizations, schools, and synagogues complemented urban life. In 2005 there were well over 100 synagogues in Los Angeles and the immediate vicinity and almost 40 in the greater San Francisco-Oakland Bay area. In the smaller cities of the state there were congregations from Chico and Eureka in the north to Chula Vista and El Centro on the Mexican border. Fourteen communities maintained Jewish Federations: Bakersfield, East Bay, Fresno, Long Beach, Los Angeles, Sacramento, Salinas, San Bernardino, San Diego, San Francisco, San Jose, Santa Monica, Stockton, and Ventura. Ten Jewish periodicals were published within the state from Los Angeles, San Francisco, and San Diego. There were Hillel Foundations at almost every major college and university campus in the state. The state is a rich Jewish religious and cultural center with Jewish museums, such as the Judah Magnes Museum in Berkeley and the Skirball Center in Los Angeles, chapters of most Jewish organizations and significant theological seminaries. Some national and international organizations such as the Simon Wiesenthal Center and Mazon have their headquarters in California. In recent years Jews from all over the world have immigrated to California, and its Jewish composition continues to be diverse. With institutions and congregations that reflect all aspects of Jewish life, California Jews have thrived in an urban multi-ethnic society. As of 2017, California's Jewish population was approximately 1,230,540. Sources: Encyclopaedia Judaica. © 2008 The Gale Group. All Rights Reserved. A.F. Kahn. Jewish Voices of the California Gold Rush: A Documentary History, 1849–1880 (2002); idem (ed. ), Jewish Life in the American West: Perspectives of Immigration, Settlement and Community (2002); A.F. Kahn and Marc Dollinger, California Jews (2003); R.E. Levinson. The Jews in the California Gold Rush (1994); M. Rischin and J. Livingston (eds. ), Jews of the American West (1991).